-Strengthen the communication and cooperation between China and Countries along One Belt One Road (OBOR) initiative of China. -Inspire innovation and stimulate interest among young students for promotion of science and creativity. PSF sponsor participation of Pakistani young scientists with the objective to give a greater insight into science and its application for the benefit of all mankind through participation in the said event. The students shared their ideas and projects with fellow students around the world and eminent scientists. The programme open up opportunities for youth by combining hands-on enriching cultural activities and outdoor adventures with access to fascinating people, places and events which will reflect well for their future access to universities and employment opportunities. In the said camp 120 students from 16 countries alongwith 30 teachers participated. Miss Zaiban Farooq, Assistant Director (Caravan) also participated in as group leader to guide and assist students in preparation for camp activities including a teachers training session. The opening ceremony was held on 18th Dec, 2017 in the Auditorium of Beijing High School No.35, Beijing which was attended by senior official from Ministry of Science and Technology, China, Directors of Children & Youth Science Centre of CAST, President ECOSF Dr. Manzoor H. Soomro, Ambassadors of different countries and First Secretary for culture and Education, Embassy of Pakistan, China Mr. Raheel Tariq. Prior to this, students performed cultural activities during welcome dinner on 17th Dec, 2017. The students work in the mix groups of students from other countries where they were briefed about five different disciplines according to their interest. These students were part of the groups working on "Bridge Model Design and Making" and "the intelligent robot study and application" All the students performed with their best abilities during the camp. They prepared models as per instruction and give brief presentation on their learning experience and projects. Jury marked their performance and all four students with the grace of Almighty Allah won Best maker Award individually based on their project design. Mr. Shadab Ahmed won two prizes i.e. Best Maker and Best Team Work. 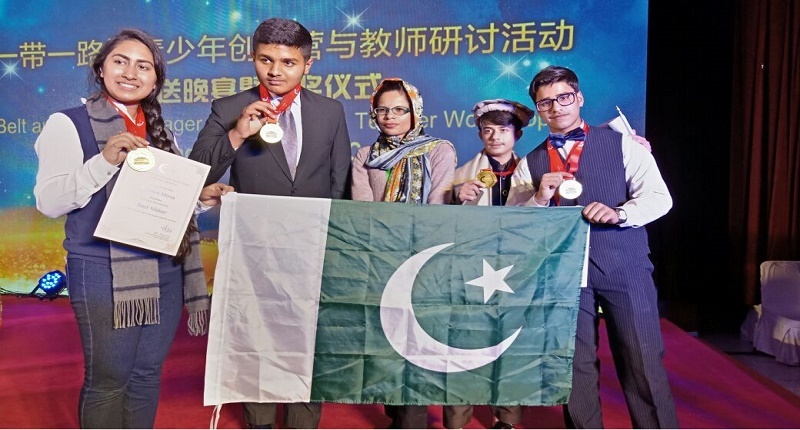 Pakistani students with their medals and certificate for shining in “The Belt and Road Teenager Maker Camp & Teachers Workshop” held on 17-22 Dec, 2017 at Beijing-China. Miss Zaiban Farooq besides guiding the students during the camp also attended teachers training workshop and Science Education Forum wherein she briefed all the participants about PSF activities through presentations. Later on, teachers workshop on "Intelligent Weather Forecasting Equipment Design and Making" was conducted which boosted the knowledge of the participants. The closing ceremony was held on 21st Dec, 2017 wherein teachers and students were awarded certificated and medals which were distributed by Mr. Liu Yang, Deputy Director General of Children & Youth Science Centre of CAST. He also thanked and congratulated the winning students and teams. Miss Zaiban Farooq also presented PSF crest to Mr. Liu Yang, Deputy Director General of Children & Youth Science Centre of CAST as a token of thanks.